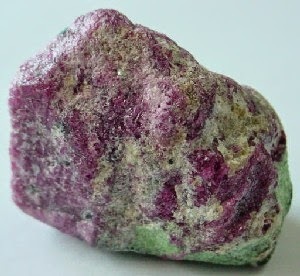 Ruby in Zoisite contains the properties of both ruby and zoisite. The only problem is, zoisite has a very short history of use as a metaphysical stone and there is almost no information known about it by itself. 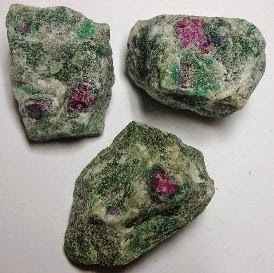 This is probably because except for the occasional larger stone that is cut into smaller ones, zoisite always has ruby growing with it and its metaphysical properties are affected by the ruby. Ruby in Zoisite, also called Anyolite, is a combination crystal that contains both the properties of fiery Ruby and earthy Zoisite, but you can also look up Ruby Properties for every Anyolite stone will also contain those energies. This stone contains small Ruby crystals that have become embedded in Zoisite. It is a “marriage” of passion and patience. Zoisite is a powerful gemstone that can transform negative energy into positive and when combined with Rubys abilities, magnifies the stones ability to help amplify the entire energy field and release the talents and abilities of your mind. The combination of ruby in zoisite is perfect for those seeking to reach a trance state. Not only does it help you reach that state, but it helps connect you to the energies of others and maintain your own individual energies at the same time. Ruby in Zoisite helps to open your intuitive abilities in a way that allows you to sense when the challenges life throws at you are just a part of living or due to someone wanting to intentionally cause trouble for you. For instance, in a work environment, we are often asked to do tasks that are not normally part of our normal routine. Sometimes this happens simply because things occasionally happen in business that must be done but are not part of the normal operating procedure. Sometimes this happens because of other employee’s jealousy trying to hold you back or punish you in some way. Ruby in Zoisite will help you know the difference.